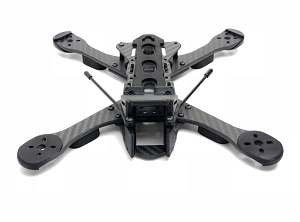 This Hyperlow mid-mount racing frame features a new approach to arm design developed by Bob Roogi (Hyperlite/Floss); a double stack assembly with all the benefits of a vertical arm, and none of the drawbacks. 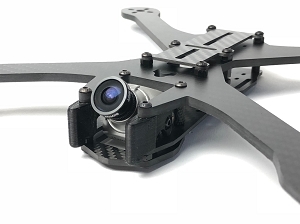 At 10mm tall and 4.5mm wide, the arms allow for the motor mount to be cut from the layer, with the bottom layer adding extremely rigid support and the benefit of aerodynamic positioning. The arms then double as standoffs, with the kit only needing a total of two for camera mounting. 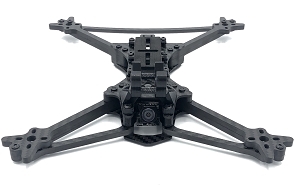 Mid-mount battery positioning helps gives the frame fluid maneuverability, while a double strap plate and adequate prop berth can house up to a 1600 (Who Cares:) lipo safely. For additional support, and to provide feedback, please refer to the Hyperlow Pilot Page on Facebook. Landing pads for under main body. 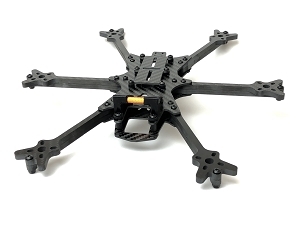 Its recommended to assemble the frame minus the top plate during the build. Dry fit all components first. Orient FC for best fit, paying attention to USB access. This may involve flipping the board, or rotating it, and also adjusting its height. 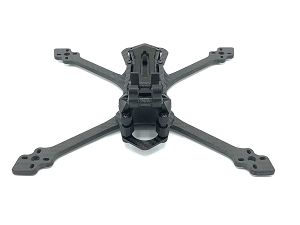 VTX orientation should allow for pigtail to reach the rear mounting point. 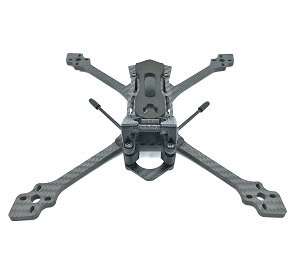 VTX occupying the 30x30 area behind the front arms and FC mounted in rear. RX can also sometimes be placed atop of VTX, or underneath FC. 14mm bolts + locknut to attach arm and brace. 16mm bolts through top plate and arms to pressnuts in bottom plate for a 10mm build.